Another Fallen Leader, A New Challenge: Who Will Pick Up His Sword? New York, New York: August 29” It’s been hard for me to unplug from this weekend’s telethon honoring Teddy Kennedy. First there was Friday night, at the Kennedy Library where the wake, or what was called a memorial service took place with so many recollections pumped up with more of that black and white footage that has documented the Kennedy family for so many decades. And then came Saturday morning with its inspiring funeral service at the Basilica, in Boston’s still poor South End. The services there usually cater to the Spanish speaking. Today it was so full of well known rich white people who NBC described as the “power elite” of America. The oratory zoomed, from the most banal to the most eloquent, stunning reminiscences and warming moments of remembrance. In death, Teddy Kennedy had transcended all the contradictions and dark clouds that engulfed him in life—all the family tragedies and political setbacks. He was resurrected as the hero we really need in these times, someone with a consistent sent of commitments and bedrock values who, while good at playing the political game, cajoling friends and enemies alike, a gift here, a personal favor there. He was the unyielding advocate that many feel our President, his choice, has yet to become, despite his mastery of language. And yet somehow all the Catholic liturgy with his focus on the poor was the perfect setting, even though a conservative Pope has yet to send a condolence to this liberal practitioner who made sure that there were references to gay right in the Cathedral. He seems to have gone from being a wishy washy liberal to more strident progressive? Who will pick up his sword? Can we trust our President to slay the dragons he fought all his life? I didn’t live the 60’s in black and white. It remains very present to me in living color, I was part of those times, albeit a small part, a soldier in movements for change, a street level organizer more than a suite-level manipulator. I resented the political elite then and believed in a bottom-up populist politics of participation. To me our ritualistic elections do not a democratic society make. I was never enthralled by the Kennedys, because I didn’t think America should be a home to royal families and an aristocracy. I remember Jack’s equivocations on the War of that time and eventual decision to escalate what was to become a national tragedy. I remember brother Bobby at first hesitant to embrace civil rights and look the other way when civil rights workers like my friend Jerome Smith was beaten in the deep South. I remember reading about the Mafia like business dealings of their dad, “the Ambassador,” Joe Kennedy who made his fortune running booze during prohibition, and who appeased Hitler when posted to England. The Kennedy magic cannot erase these and other failings. But I also lived in the era of the assassinations and all the unanswered questions that remain all these years later. There were people who hated the Kennedys and wanted to do them in. I made a film called BEYOND JFK that addressed the question of conspiracy. In it we interviewed the man who was my Congressmen during my years in Cambridge and Somerville, the House Majority Leader “Tip” O Neil, another large Irishman with fidelity to the Kennedy’s and the political machine he was part of . In what may have been his last interview, this grandmaster of Massachusetts politricks, told us that he was told by Kennedy aides that there were other shots in Dealey Plaza that day. He lent his voices to the chorus of those who believe that the truth has not been told. And yet, when you watch how the Kennedy funerals were not just about the man, but about his family, not just about his achievements, but about his interactions with ordinary citizens, not just about his big imprint but about the love he gave and received, you had to feel a little better about living in these dark times. These events were teachable moments, transmission belts of values and a kind of political vision that seems to be vanishing at the very time it is needed most. Friday night’s talkfest was dominated by pols of right and what passes for left. Aside from the amusing sailing stories, I thought Caroline’s recounting of her Uncle’s love of history was most moving and meaningful. There they were in the museum that honors their work, itself now a monument to history. I was last there in 1990, when Nelson Mandela visited Boston and was greeted by Ted and Jackie, saluted by Stevie Wonder, and heard him describe himself as an “Irishman from Soweto.” That scene is in my film MANDELA IN AMERICA, its most inspiring moment. In the museum, there is a photo of Bobby Kennedy’s visit to South Africa in the time of upheaval there. The Kennedy’s cared about the world. I lived and worked in Massachusetts’s media. I covered the political ups and downs, heard the stories, resented the ruling political fraternity and yet came to realize that Ted had seeded a political culture than was bigger than him—and he was a big man with a big voice and even bigger sense of personal majesty. He appealed to the best in the voters, talked about real issues, embraced labor and causes that sometimes made his constituents nervous. He cared about immigrants, the disabled, the sick. He wanted them to care too, even when they gave him a pass. They were still proud to walk in his footprints and believe in his promises. The country didn’t know him as well as they did. 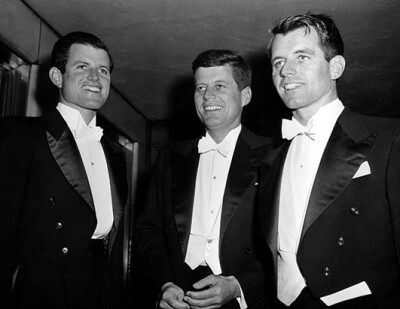 Perhaps, thanks to television, they do now, although, truth be told, not everyone felt that Kennedy did as much as he could given his identification with the Club that is the Senate and the Party that has moved to the center and right. And yet the speechifying in the Church was uplifting, from Parish Priest to the children, to the Sons, to the President. All were moved and moved us. It was the kind of funeral we would all like to have. The kind of moment that will stay with us for a long time. One problem: the real power elite is not just made up of politicos. It is controlled by our corporate rulers. They were not in that church. They are in their country clubs and boardrooms, counting their lucre and happy to see right battle left as long as they are left alone to amass their billions. They are behind the attempt to scuttle health care reform, and keep our profitable for some wars going. “He saw war and tried to stop it,” said Ted of Brother Bob.” But who is trying to stop the wars now? Who is even talking about them? We seem to have been living through what’s been called a summer of death by well knowns—Michael, Farah, Walter, Don, Dominic and now a young DJ in New York—but, of course, others are dying whose names we don’t know, who we don’t hear about or maybe care about, in Iraq and Afghanistan, Pakistan, and Burma, and among the growing ranks of the poor in a world menaced by curable diseases and economic deprivation. Can we as a country honor them they way we honor our own, can our TV Screens portray their struggles as they do those of the people on top? Can our hearts open to their pain and need? Can we walk the talk that Teddy tried to walk? Can we still hear and will we respond to his call for health care reform and so much more?